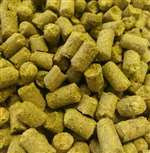 Magnum hop pellets. 11-16% AA. A delicate aroma with inclinations towards floral and fruit flavorings and a prevalent hoppy tang. Daughter of US Galena, it is typically used with ales. Possible substitutions for Columbus and Nugget.